Are you wondering which was the biggest dinosaur ever? Dinosaur came in all shapes and sizes. Some were as small as chickens, others were much much bigger! There's something fascinating about finding the biggest dinosaur ever. The search is always on for dinosaurs that are even bigger than the ones that have already been discovered. On this page we'll take a look at the biggest carnivore and herbivore dinosaurs that ever lived with lots of resources where you can learn more about these huge prehistoric creatures. Is T-Rex the biggest dinosaur ever? Lots of people say T-Rex if you ask them what was the biggest dinosaur. Wrong! It's a popular misconception. 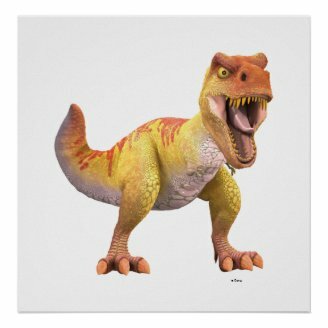 T-Rex is a childhood favorite dinosaur and would probably win a most popular dinosaur contest. T-Rex was big, but he wasn't the biggest dinosaur. T-Rex grew up to around 6 meters or 20 feet tall and 12 meters or 40 feet long. Now that is pretty big - as tall as a house. Imagine Tyrannosaurus Rex looking in through you bedroom window! T-Rex was big, but not the biggest dinosaur. Is Spinosaurus the biggest dinosaur ever? 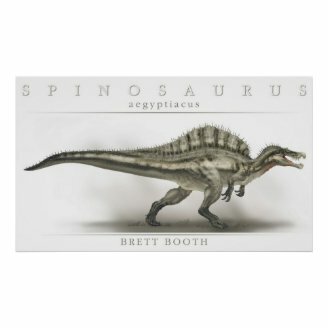 You may have heard that Spinosaurus is even bigger than T-Rex. After all, Spinosaurus beat T-Rex in Jurassic Park 3. Since his starring role in Jurassic Park, Spinosaurus has become a contender for the most popular dinosaur - he's almost as popular as T-Rex with kids. But, was Spinosaurus the biggest dinosaur ever? Spinosaurus was a bit taller than T-Rex and much longer, up to 60 feet or 18 meters long. That's big! You would need 10 tall adults to lie in a line head to foot to be as long as a Spinosaurus! Spinosaurus was heavy too and had a huge sail on his back. Spinosaurus was the biggest carnivore. But not the biggest dinosaur. We need to keep looking. The biggest dinosaur wasn't a carnivore at all. It was a herbivore from the Sauropod family of dinosaurs. Brachiosaurus is a well-known dinosaur from the Sauropod family, but he's not the biggest of the Sauropods. Diplodocus is another well-known Sauropod. He was even bigger. Diplodocus could reach 35m or 115 feet in length, now that's long! Diplodocus was thought to have been the biggest dinosaur. But other evidence indicates that there were even bigger dinosaurs than Diplodocus. We love this really long toy Diplodocus! So who was the biggest dinosaur ever? Amphicoelias is currently thought to be the biggest dinosaur ever. The longest, tallest and heaviest. Of course dinosaur paleontologists are learning more about dinosaurs all the time, maybe they'll find a bigger dinosaur. Scientists think Amphicoelias could have been up to 200 feet or 60 meters long! A long school bus would be around 40 feet long so Amphicoelias could have been as long as 5 school buses. Wow. Supersaurus is also thought to have been longer that Diplodocus. Paleontologists have only found partial skeletons of Supersaurus and Amphicoelias. So we have to say Amphicoelias was probably the biggest dinosaur ever! Or maybe it was Argentinasaurus, another massive Sauropod. Watch the clip from the BBC's Extreme Dinosaurs to hear all about Argentinasaurus. We hope you enjoyed learning about the biggest dinosaur ever. Are you planning a Classroom Dinosaur Dig? Find ideas and resources to help the children learn all about dinosaurs. Great for schools, clubs and summer camps. Choose a Dinosaur Lunch Box, Bottle and Backpack for your child. These are great for taking your Stegosaurus Sandwich to school in! Great quality and definitely cool. Dinosaur Activities for Children to enjoy at school, homeschool or just for fun. Lots of ideas for studying dinosaurs and using dinosaurs to engage children in learning. Have you seen these cool dinosaur hoodies for kids and adults? They have wrap around arms to make the dinosaur roar! Very neat. Just imagine how much it had to eat everyday to get enough energy to do something as simple as respirate. Mariana trench is trench in Southern Pacific with Challenger Deep as the deepest point on the Earth. At Challenger Deep, ocean is 10.916 m deep, and it is full of secrets!